Essential PIM is an appointment and information manager. 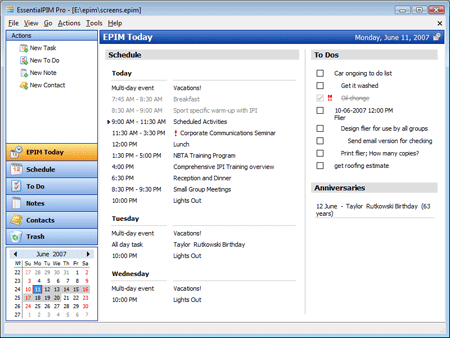 It can be used as a scheduler, contact manager and outliner. It includes an address book to help manage your contacts and a notes manager with support for rich text notes. The address book supports pictures and lets you add or remove fields and further customize it to suite your needs. The schedule allows you to mark appointments in different colors, and allows you to drag an appointment to move or reschedule it. Data can be imported from Outlook, TreePad, Google calendar and more and then exported to HTML, vCard, iCal, RTF, CSV and text. Data can also be protected with secure 128-bit encryption.